Succulent planters come in so many shapes and sizes that it can be difficult to find the right one for your succulents. Did you know that choosing the wrong pot could leave your plants waterlogged or can actually hinder their growth? 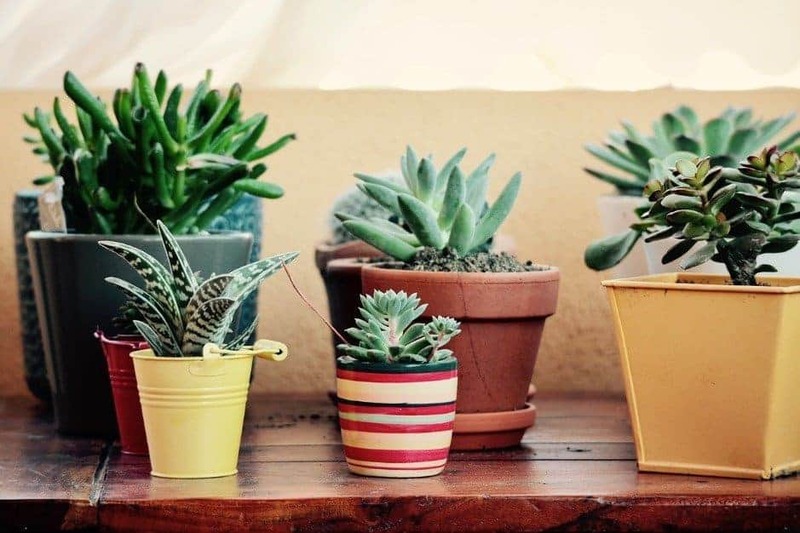 These 5 tips will help you choose succulent pots that will help keep your fat plants healthy and let them thrive! The best planters for any type of plant is one with drainage so any excess water can drain out from your soil. When your soil is too wet for too long, two bad things can happen: your plant’s roots can rot and mold can grow. Making sure to have a pot with drainage will help keep those two things from happening! 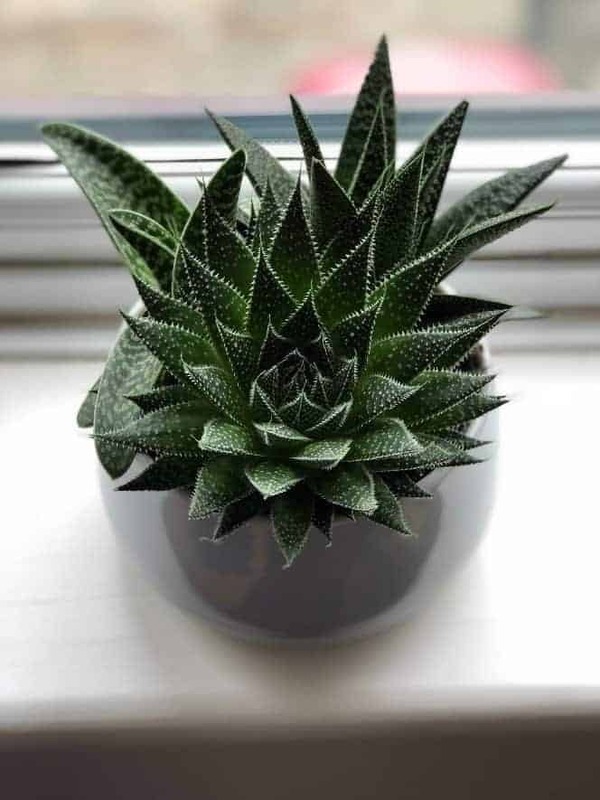 Already have a pot but it doesn’t have a hole for draining? You can often drill holes into plastic, terracotta, or concrete planters as long as you have the correct supplies and use the proper techniques. With succulents, you want as much drainage as possible—drilling several holes will allow the water to escape faster than if you drilled one hole. Sometimes planters can have large holes. You put soil in and it falls right out through the drainage hole! 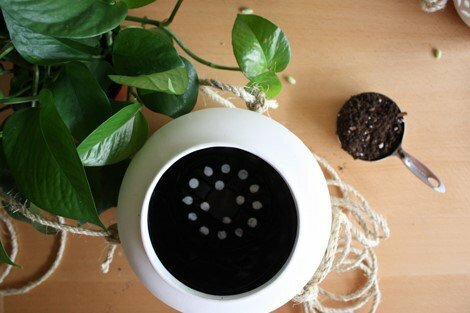 If this happens, you can use a piece of mesh screen or even a coffee filter to help keep the soil inside the planter. Just like how you wouldn’t put a single shot of espresso into a tall mug, you wouldn’t put a tiny plant into a huge pot! When looking at pots, be sure to get a pot that is tall enough to hold your plant’s root ball and also gives some (not too much) room for the plant to grow. A happy plant will grow strong roots and will maybe even give you babies! Don’t get a pot that is too big for your plant; if you do, you can actually stunt its growth! You can however put several small plants into a large pot to make an arrangement. This is a fun project, but can sometimes become tricky when the different plants have varying sun and water requirements. For succulents, some materials actually are better than others. For example, planters made of unglazed clay or terracotta are porous and can absorb water from wet soil. This may be great for the gardener that overwaters their succulent, as the terracotta can help to dry the soil out faster. However, there are a few downsides to terracotta. First, they are heavy and can be difficult to move around. Second, they can crack during the winter if you live in a place with freezing temperatures. Third, they can dry out your plant’s soil too fast if they’re in a hot and sunny spot. Another material you can use for succulent pots is plastic. They are lightweight, very easy to care for, and come in a variety of colors. There are even 3D printed pots made of biodegradable plastic in animal shapes! Plastic is not porous like clay, so any water that doesn’t escape through drainage will stay in the pot until the plant soaks it up or it evaporates. Some of the succulent trends these days involve using glass terrariums. They’re beautiful, but not entirely practical as succulent planters. Glass bowls and terrariums are ideal for high humidity plants (like air plants and ferns), and not really for desert plants. That’s not to say that you can’t successfully grow succulents in a terrarium! Wood planters are another trendy item that has gained popularity on Pinterest, Instagram, and DIY websites. Wood is okay for planting as long as it doesn’t absorb water—if it absorbs water, it can decay or grow mold. If going with wood, get a planter that’s been sealed, or seal it yourself (and of course, be sure there’s drainage!). There are many more material types: concrete, resin, ceramic, metal… Just keep in mind that glazed/sealed pots will not have the water-absorbing and aerating properties as terracotta and unsealed concrete, and they’re less likely to have problems in winter if left outside. What are the conditions of where you’ll have the planter? Are there animals or children who will disturb or knock it over? Do you need something that will fit on a windowsill, a table/counter, or do you need to use a hanging planter to keep plants out of harm’s way? By deciding where your succulent planter will go, you’re actually deciding what material type and pot size you should be using. 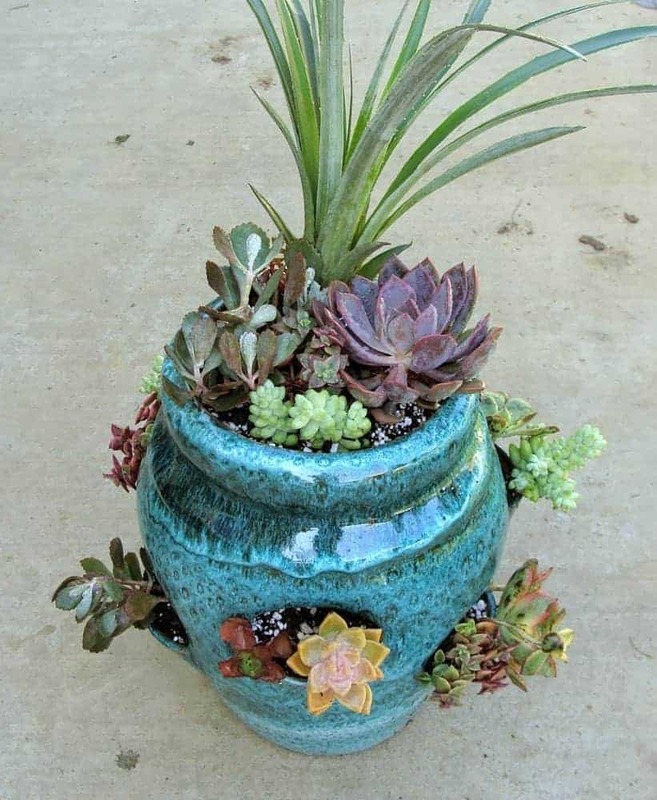 Some planters with specific purposes are perfect for succulents. Bonsai pots and strawberry pots are well-draining pots with the right size and spacing for fat plants. Bonus: they look great with succulent arrangements! You can also repurpose everyday things into succulent containers! There are interesting objects at thrift stores, garage sales, and antique stores that can become beautiful vessels for succulents; so keep an eye out and keep your mind open to the possibilities. This is a guest post by our friends over at Print A Pot! 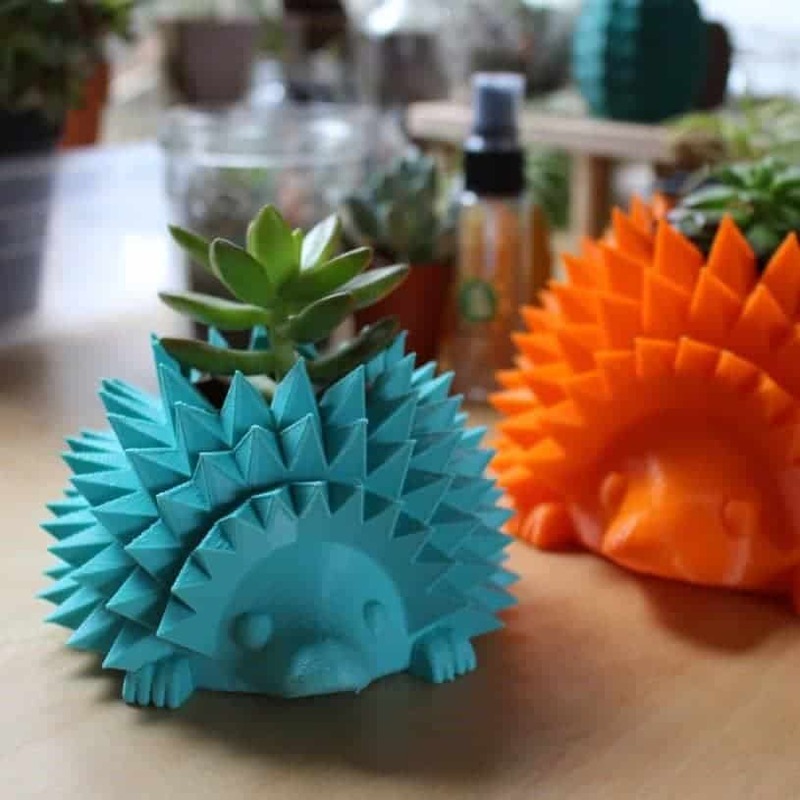 They have some adorable, 3D printed planters – check them out! Mercy is a dedicated plant mom who loves container gardening. 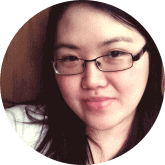 She owns and operates Print A Pot with her husband, where they design and manufacture 3D printed pots for succulents, cacti, and air plants.